My sidekick. Ages 2 and up. I had a dream about eating bacon last night. That is just plain cruel. Have you ever noticed the sheer number of commercials that are about food? Or how much time people spend talking about food each day? It’s uncanny. What about how simple your eating habits are as a student? My parents seem to make steak and salmon dinners several nights a week. I think when I’m able to eat again, I may commit to driving 45 minutes each way every night after work just for a bite to eat. Seriously. In other news, both of my lips have officially shed a layer in their entirety–like a snake. I’m not sure if that’s expected or not, but it happened. Vaseline has become my new best friend. I’ve also become surprisingly decent at the game of Crib. I’ve skunked my father 3 times and my mother once in the past few days. We tried playing Scrabble, but my vocabulary just isn’t extensive enough to elicit any joy at all from that game. I need mathematical games. I think Backgammon is next on the list. Or maybe Chess. I’m still spilling every now and then when I eat and drink. I was drinking water yesterday, for example, and felt it running all down my shirt. I became quite frustrated and ran to the bathroom to see what the problem was. When I looked in the mirror, I realized the syringe wasn’t even inside my mouth. I was literally spraying water down the side of my face. Oh, the joys of being completely numb! Administer by syringe and enjoy! The bad news of my day so far is that my jaw feels like it’s set improperly with these new elastics. I didn’t sleep a wink last night (except for my 5-minute bacon dream, of course) because my bottom teeth were grinding against my splint and the muscles in my jaw were spasming all night long. I’m heading back to my surgeon right now to get it looked at again. Okay, now for the educational part of today’s post: the purpose of that horribly hindering splint. Part of the surgery I underwent involved widening my top jaw quite extensively. Since bone was removed, the muscles in my mouth would naturally force my top jaw to reshape into its previous state. The splint is inserted to keep the jaw widened. In 7 weeks, I have an appointment with my orthodontist. She will kindly remove the splint, only to replace it with a metal appliance that will sit in the roof of my mouth serving the same purpose. I’ve been informed that the appliance is removed after 3 months because, at that time, the bone has filled in, and the muscle isn’t strong enough to overcome bone. It’s similar to having to wear a retainer after a person has their braces removed. If they don’t, their teeth will migrate right back to where they came from. I learned something quite amusing this morning as well: dogs, much like children, cannot understand what I’m saying. When I call my parent’s dog, Abbie, I receive no response. I can call her 10 times. Nothing. If anyone else even whispers her name, she jumps up and comes running over. Silly puppy. Thank you so much for sharing your experience! It’s really helped me see what’s normal and what’s not. I’m at day 10 of my recovery (double osteotomy, genioplasty, mandibulectomy, fat grafts, and bone grafts). The physician’s assistant at my doctor’s office actually said that at day 4 when I ran out of pain medicine, that I shouldn’t be in pain any longer! Thanks to your blog, I could see that pain well past the 4 day mark was a common experience and fought for another prescription. I finally got it yesterday and was able to sleep through the pain again. AJ, I’m going through the recovery process right now and my procedure is remarkably similar to what you’re getting done–they moved my lower jaw back slightly, widened my upper jaw and moved it forward, then realigned everything and I’m now wired shut with the splint in place. My surgery was January 26, so that puts me on day 6. The splint doesn’t go back far enough for me to feel any kind of gag-inducing feelings, for what it’s worth. I haven’t seen it, but it feels like it only extends back as far as my rear-most molars in the roof of my mouth. I’ve noticed there haven’t been a ton of recent comments here (the blog is almost 7 years old, after all!) but it was nice to see one from as recent as this month. I wish you the best of luck! Thanks for responding. I Hope your outcome and recovery is good thus far. Are you doing photos to see the before and after? I have like 1/2 inch underbite that extends further out from the upperjaw. How was day 1-7 with pain, discomfort and getting by? I’m really nervous because I don’t want to be puking with my mouth shut with tight elastics. My surgeon stated that I’ll have the tight elastics to keep my mouth closed for a week until the initial swelling fades. afterwards I’ll see him one week post surgery were he will remove them and insert loose bands. He did say I’ll be wearing the splint for 6 weeks. I still have to see the ortho in a week to insert the wire with the hooks and do two more molds of my mouth. I’m planning to incorporate some homeopathic medics like Arnica and a few others to assist in healing. Yeah, I took ample before photos and have taken a few of the recovery process so far. I’m hoping to have a nice collection by the time this is all done in… 8 weeks? 12 weeks? I don’t even know. I’ve seen a lot of people talk about having elastics to keep your mouth closed, but my surgeon has me wired shut with actual wire. I have a pair of medical wire-cutters I have to carry around with me in case there’s an emergency and my mouth needs to be opened. For me, the first 4 or 5 days were pretty rough. I was in the hospital overnight and then discharged the following day. My recovery room time didn’t go too well–they wheeled me out of there and into my hospital room before I had even woken up, so I never got to tell anyone I was feeling nauseous. The end result is that I did throw up, about 4 times, the day after the surgery. I’ll be frank–it kind of sucked. That said, it wasn’t the end of the world. The hospital suction device was helpful and got most of the gunk out. Aside from that few hours of unpleasantness in the hospital, I had some serious trouble breathing for the first 4 days. Since my lips are so swollen and my jaw is literally wired closed, I could only breathe out of my nose, but it was mega seriously clogged. I mentioned it to the nurses and doctors, but they basically told me it gets better. I wound up going back to the ER over the weekend because I was struggling so hard to breathe. They gave me some medicine to ease my congestion, but the next morning (day 5) I found out what my trouble was. It’s kind of gross, but I had two giant clot/booger wads basically forming corks in my nose. They were insanely huge. I’m talking the size of my first thumb joint in each nostril. They eventually came out with the help of some saline nasal spray, Q-tips soaked in hydrogen peroxide, and some manual stimulation (ew). I can say that after the “plugs” came out, it’s been a lot easier. Night-and-day, although it’s still a long road ahead. It can be scary to think about what it would be like to vomit with your mouth wired shut, but it’s manageable. I had a coughing fit earlier today (one of my pain meds irritates my throat) and it caused me to throw up one more time. Fortunately, I’ve been on liquids only for almost a week now, so… it wasn’t the end of the world. Messy, a little gross, but it’s just part of the package. I did order saline nose spray and the saline with aloe gel drops to see if it helps loosen and break things down in the bloody booger world. I even have the “breathe right” nose strips and expand the nostrils to get more airway space. You mentioned you used q-tips, I wonder if plastic twizzers would be handy to have for the grabbing and pulling effect? My fear also is dry throat so I’m not sure what can be used to swallow and lubricate it besides coconut oil or olive oil which might be handy? AJ: Breathe Right strips sound like they could be helpful. Wish I had thought of those. I did consider tweezers for a while, but in the end thought it was too risky. I didn’t want to go fishing around up my nose and wind up pulling out some swollen flesh or stitches or who knows what. Also, full disclosure, I got my procedure done via the military, so I wouldn’t be surprised if they kind of cut corners with things like patient comfort. Small world Jake, I’m doing mine with the AF. I just had surgery on my upper jaw widening it and currently am on Day 5 post op…. The scale of inconvenience is 15 on a scale of 1-10…All I can say is towels to catch your drool and Vaseline for your lips will be your best friends. I’m on day 18. Still have some swelling but more on my right side of my face than my left. I’m not crazy about the splint but it won’t be removed until April 12 and I can’t wait so I can speak again and chew food. My upper was widen by 5mm and move forward and my lower was moved back so I clearly don’t have an underbite any longer. I’m on this day and experiencing some of the same problems. This blog is awesome. Hey graham I’m on day 9 of post op double jaw surgery. I’m worried that my jaw shifted and I’m not biting down on my splint correctly. The thing is I never got a grasp of how the damn thing should fit even when they first fastened it on. I see my surgeon in 3 days. Think I should wait to ask about it until then? Daniel, if the splint is currently causing you pain (eg. it’s grinding against your teeth and putting painful pressure on them), I would call your surgeon’s office to ask about that. If there’s no pain involved, you should be okay to wait for the 3 days until your scheduled appointment. Good luck! Hi Danielle, I am Day 10 post well really Day 3 after the screws on the lower jaw did not hold and I had to go back to OR a week later to have the lower jaw done again. Anyway 2 tips for you. First I think that well cooked ramen should work for you as long as you remove any hard bits e.g. carrot. Also I would not cut the noodles, too much work, I would probably mash and smash the dickens out of them, as long as you can draw it up into a syringe. Today, to my dismay, I too realized how vulnerable I am feeling. And it seems so sudden I cry at a cute commercial for dog food; when I bumped the top of my head on a cabinet handle while filling kitty’s bowl I collapsed sobbing on the floor. Never been this way before in my 64 years! Don’t know how long this will last but for now I plan to savor every tiny victory each day. These blogs are lifesavers aren’t they? Now you let us in on some tricks that you discover! Thank you so much for this blog! It’s incredibly helpful for me as I make my way through the recovery process even now in 2016. I’m on Day 8 and so far the worst parts for me are the splint and all its related issues and my braces digging into my upper lip (along with the stitches). Did you have much trouble with clumps of liquid, etc. getting stuck underneath your splint? I’m having a lot of trouble with that because it causes my splint to feel like it’s separating from my upper jaw. Also every time I swallow it creates a painful suction against the splint and feels like it’s digging it into the roof of my mouth. The suction of my saliva is also an issue because it digs my braces into my lips where my stitches already leave them so tender. Any advice on this? Wax can only do so much, plus I’m worried about swallowing the wax when I sleep or am not paying attention. Finally I’m having the same problem where my jaw jumped out of place during a spasm and now it doesn’t seem to fit in the splint well anymore. I’m wired shut though (instead of elastics) so I’m not sure if my doctor can fix that until it’s time to cut the wires in another two weeks. Regardless, how will I handle not brushing at all for another two weeks?? Any advice you have at all – or encouragement – would be so so helpful. 1) I also had clumps of liquid (such as soup and smoothie bits) that would get trapped under my splint. Not only does it end up smelling awful, but it can cause pressure in your mouth as well. I was usually able to dislodge these bits by gently swishing warm salt water, but I admit that sometimes it would take a couple of days, which was really frustrating. 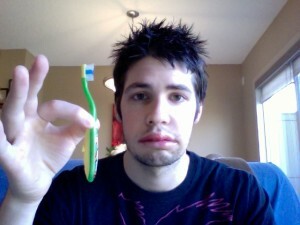 You may also have luck with a Waterpik flosser, though I did not try this myself. 2) When this happened to me, I visited my surgeon because I was afraid it would negatively impact the healing process. He gently moved my teeth back into the grooves in my splint, but told me that it doesn’t really matter as the spasms will come and go for a number of weeks. That being said, if you are experiencing pain or extreme discomfort due to this, you may want to pay your surgeon a quick visit just to be safe. I’m on Day 7 of upper and lower jaw surgery. Today it feels like the splint maybe moved or something because i can talk better and smile wider. Does that just mean I’m healing? I know that you started this blog in 2011 and it is now 2015, but, I have read this and laughed,cried, and even sighed with relief. Your documentation of this journey has helped me tremendously. So, thank you for doing this for all of us and I hope you are doing wonderful! So I am scheduled to have double jaw surgery in May. When I went to my appointment yesterday I was informed that my teeth would not be rubber banded together at all (Dr. said my top jaw would be weak and banding it to my stronger lower jaw would pull it back into an underbite). Did anyone else not have their mouth banded shut??? I had double jaw surgery to cottect my underbite and I did not have my teeth wired shut or have a splint put on my top jaw. Currently I am day 9 post op. While in the hospital I asked the surgeon residents why I didn’t get a splint and was advised during surgery the splint fit perfectly and there was no need for it following surgery. I also asked why I did not receive elastic bands at least and was told my surgeon felt once the swelling went dowm (the swelling was pretty bad, especially on the right side) my bite will naturally go back into place. Now when I look in the mirror at my jaw, once I lift up my swollen lips for a better view, the jaws do not looked aligned. I cannot close my teeth togother so although my cheeks are swollen. Bottom line, I am very concerned about my bite not aligning properly without the splint or elastic bands. I will call my surgeon’s office tomorrow to ask about it. How are you doing now Jensen? Hi mate, I had my surgery 9 days ago, and I spent 7 endless days in the hospital(things in Italy are always slower), I had double jaw surgery and got an amazing splint, but it covers only my top teeth , leaving the roof of my mouth free 🙂 I was wondering if u were drinking from a syringe because your surgeon told you so or you couldn’t do else, because I can drink from glasses since day 6, even tough I spill like 20% of the drink(or soup). Well ill be 3 weeks out of surgery next week and I have to go back in because my lower teeth aren’t hitting my splint… the surgeon is going to remove and replace my splint.. is this gonna hurt? ? Did it hurt when your splint was removed?? Were you sedated or awake? Also, so sorry. But I’m only 15 and weighing in at 104. Although the weight loss will vary due to size and proportion, I don’t have 10 pounds to lose healthily, ha. Any suggestions how to keep from being extremely malnourished? Abby, I also had both jaws operated on. Since the splint serves to maintain a wider palette, you will only have one put in on the roof of your mouth if the surgeon had to expand your top jaw. I’m undergoing my double jaw surgery on the 24th on this month. Since I’m being operated on both jaw will I have a splint put on both? Does the splint cause very much pain? I ended up just calling my surgeon and getting an appt today. He shaved the back of it and it’s much better, but of course now he says I only need it at night due to my healing going so well 🙂 The salt water is definitely helping, thanks for the time and advice! I couldn’t sleep last night because of the sores, and I literally just read down this. It’s made me feel a lot better about the recovery! I do want to say, I’ve struggled just as everyone else has and had such a bipolar depressed feeling that made things miserable and it really didn’t think this mindset was going to go away. It was certainly reassuring to read all of these accounts and know I’m not the only one! Just keep in mind you’ve had a lot happening to you; it’s a traumatic experience! and honestly, all of the medicine that is in your body right now , all of this could be affecting you. One day you’re gonna wake up and realize it’s almost over!! It’s an empowering thing to look back at and say that you endured it. 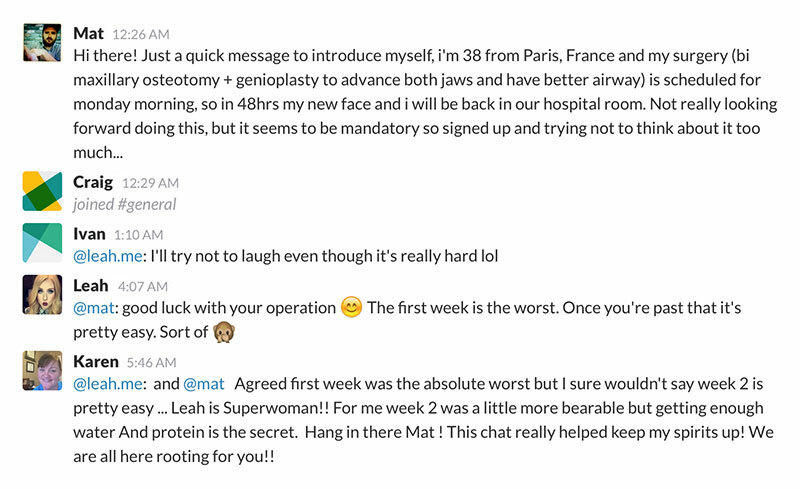 I feel like my advice seems petty compared to all of yours though, for I only underwent a lower jaw surgery. It runs in my family, my mom and brother both had it too. I can only imagine the intensified toll a double jaw operation takes; hang in there! I’ve had this surgery hanging over my head since as long as I could remember, and I’ve had my braces for a little almost 5 years, so I can only pray I don’t encounter any complications. Either way I still have a while to go, but stay optimistic!!! It does no good to dwell on it, it happened and now all you can do is try to make the best of it!! Sorry, this is the first day I haven’t woke up in tears, so I know it is very hard . and it just so happens the day I’m feeling myself coming back , I get some good news.! (<~ the splint out)… Push through! The dark Pessimism will only destroy you if you allow if too, so let your Optimism shine through! Hello! Today marks the first week after my surgery on my receding jaw (and removal of a bottom wisdom tooth), and I have a few questions and need help! My jaw seems so be healing well but I do find myself not sure of how to hold it on my own so I guess I really know I need the splint but I’m not sure what to do!! Elisha, always happy to help! Take care! How soon after your surgery did they give you the splint? I had corrective lower jaw surgery in 2011 and was never given a splint. Ever since I’ve had horrible TMJ symptoms (never had that before the surgery) and now the orthodontist wants to give me one. Do you think it would even work after 3 years? Lili, I had the splint put in during surgery and had it removed at the 7-week mark. I’m not sure what purpose the splint would serve if no expansion or contraction of the upper palette were combined with it… I would get a second opinion from an actual oral surgeon before you spend too much time considering the option.